POLYESTER BLUE SKIRT WITH OPEN FRONT AND GOLD AND SILVER SPARKLE IN THE SHAPE OF DIAMONDS ON THE INSIDE. ZIPPER DOWN THE BACK AND A BELT WITH RHINESTONE DESIGN IN THE CENTER. THE LEOTARD FEATURES A THREE QUARTER SLEEVE WITH AN OPEN BACK AND BUTTON CLOSURE NECK. NEEDS SOME REPAIR. BY SPARKLE. THIS SET IS CHOSEN BY LEOTARD SIZE, THE SKIRT WILL MATCH AS CLOSELY AS POSSIBLE. TOTAL QUANTITY: 3 SIZES INCLUDED: 1 SMALL 2 MEDIUM BY GEORGIE GIRL, THIS COBALT BLUE LACE UNITARD IS JUST AS LOVELY AS IT IS BLUE! THE UNITARD FEATURES STRETCH FABRIC AND ONE LONG SLEEVE WITH LONG PANT LEGS. THERE IS A SOLID BLUE BIKETARD FOR COVERAGE AND THE LONG SLEEVE IS SHEER BLUE LACE WITH A THUMB ELASTIC. THE OTHER SHOULDER IS ONE STRAP. 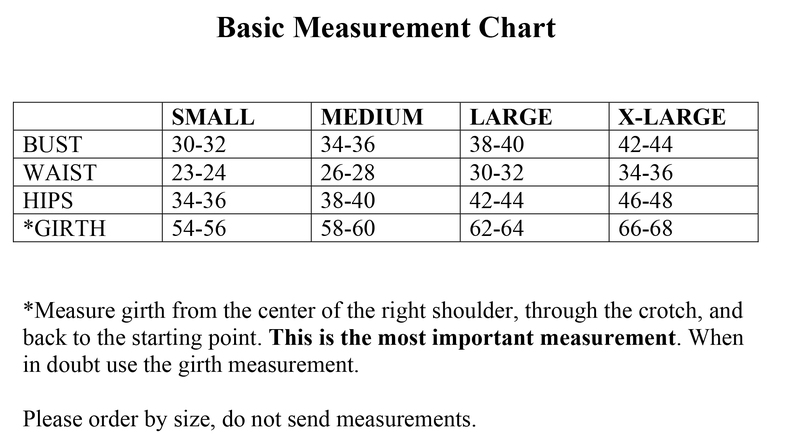 THE LEGS ARE TAPERED WITH ELASTIC AT THE BOTTOM WITH A 34" INSEAM. THIS OUTFIT DOES RUN SMALL. THE MODEL IS WEARING A SIZE SMALL. ALL CLEARANCE SALES ARE FINAL. TOTAL QUANTITY: 38 GOLD EMPIRE WAIST DRESS BUTTONS UP THE FRONT WITH ROYAL BLUE SEQUINS AND PIPING. HAT INCLUDED. TOTAL QUANTITY: 19 PINK AND BLACK POLKA DOT HALTER DRESS, REVERSE COLOR AT WAIST AND INSERT. PERFECT FOR 40'S DRESS OR DESPERATE HOUSEWIFE CHARACTER. MADE BY LEO'S. TOTAL QUANTITY: 11 FLAPPER DRESS WITH SILVER AND GOLD SEQUINS, BLACK FRINGE AND A BUILT-IN LEOTARD WITH CRISS-CROSS STRAPS. HEADPIECE NOT INCLUDED. GREAT FOR A ROARING 20'S ROUTINE! TOTAL QUANTITY: 9 BRIGHT ORANGE VELOUR HALTER DRESS WITH THREE ROWS OF FRINGE. SILVER SEQUINS ON DRESS AND FRINGE. MATCHING TRUNKS INCLUDED. CREATED BY GRAMMA DESIGNS. TOTAL QUANTITY: 27 BEAUTIFUL DRESS! BLACK LACE LONG-SLEEVED TOP WITH RED VELVET BODICE. BLACK AND WHITE STRIPE LYCRA CREATES CORSET LOOK, WITH ATTACHED BLACK CAN CAN SATIN SKIRT, LINED WITH RED RUFFLES. CAN CAN LOOK! DANCE SHORTS NOT INCLUDED. LARGE TEAM SET. TOTAL QUANTITY:23 BLACK LONG SLEEVE PLEATHER RAINCOAT WITH YELLOW COLLAR, CUFFS, AND TIE. ZIPS AND SNAPS FRONT. PLUS SIZES AVAILABLE, LARGE TEAM SET. CREATED BY LEAPIN LEOTARDS. 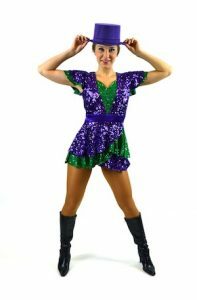 TOTAL QUANTITY: 25 PURPLE AND GREEN SEQUIN DRESS WITH ATTACHED SEQUIN BELT THAT SNAPS IN BACK. OPEN BACK WITH SNAPS AROUND THE BACK OF THE NECK. MAY COME WITH PURPLE DANCE SHORTS. HAT NOT INCLUDED. MADE BY SPARKLE. BLACK WITH PURPLE SEQUIN BIKETARD, OPEN SLEEVE WITH LARGE WHITE CUFFS. LARGE TEAM SET. GREAT FOR RENAISSANCE OR AUSTIN POWERS. CAN BE PAIRED WITH RED AUSTIN POWERS JACKET FMM90. CREATED BY A WISH COME TRUE. TOTAL QUANTITY: 4 HOT PINK DRESS WITH WHITE COLLAR, PINK POLKA DOT BODICE AND TRIM, SOLID PINK SKIRT, PINK PETTICOAT, AND NAVY BLUE BELT. FLOWER HAIRPIECE NOT INCLUDED. TOTAL QUANTITY: 37 EYE-CATCHING RED PAISLEY PRINT LEOTARD WITH OFF THE SHOULDER RUFFLE AND MATCHING RUFFLED SKIRT.